Sock knitting it is -- and more Chocolate reviews! Well. . . looks like socks are the favorite by a long shot coming in at 43% as of just a minute ago. Speaking of socks, I'm making good progress on Pete's STR socks (er, sock -- I'm still on the first one.) I'll post a picture as soon as I finish the first one. Since I have a pile of wrappers in the drawer, I thought it was about time for a chocolate update! So without further ado. . . Okay, I know there are a lot of Green & Black's fans out there, so this may not be popular, but I have to say that I was a bit disappointed with the Green & Black's Caramel bar. First let me tell you that it's an organic milk chocolate bar with a soft caramel center. The little pockets of caramel are nicely divided so that you don't have to eat the bar all at once, so that was convenient -- it's a pretty large bar after all. The chocolate was rather soft, sticky and sweet though -- this is where they lost me. You almost couldn't discern where the chocolate ended and the caramel began. I guess I wanted a more distinctive chocolate and a saltier caramel maybe? I shouldn't have been surprised since the first ingredient listed is organic cane sugar and the second is organic whole milk powder, but I love a good caramel bar and I thought G & B would come through. So far I've loved the Green & Blacks White Chocolate bar, liked the Green & Black's Maya Gold bar, disliked the Hazlenut & Currant bar so much that I threw half of it in the trash (I bought it at Target and discovered it was past it's sell by date, which could be the reason for it's "off" flavor), and found the Caramel bar dissatisfying. Hmmmm. . . I'm holding out for the Butterscoth bar, which I hear is *awesome* -- but I have yet to locate one. Any ideas where they are sold in the States? The Violet Crumble is an Australian candy bar made by Nestlé that is unlike any mass market bar in the US that I can think of. The slogan on the wrapper says "It's the way it shatters that matters" and it did shatter! Actually the first thought that came to mind as I took my first bite was -- smores. It had that toasted marshmallow taste, combined with the chocolate -- then there was the crispness of the bar. I have to say that I'm usually not a fan of mass market candy bars, but I loved this one! I've also tried the Cafe-Tasse Blanc -- White Chocolate Bar and it wasn't nearly as good as the Green & Blacks. I don't have much else to say, so I'll leave it at that. More reviews coming soon! All my talk about the type of things I like to knit got me thinking. . . What do you like to knit? What's your favorite type of knitting? Habu Silk Yarn & Japanese Linen Ribbon & Thrifted Buttons! What a busy weekend! On Friday, Maddie & I headed out early and went to the Joliet Farmer's Market to pick up some fresh fruit. I got some lovely peaches and blueberries -- fresh from Michigan. Then we hit Starbucks and any yard sale we could find on the way back home. All we found was an old copy of Richard Scarry's Going Places for only 25 cents which Maddie thought was a very funny book! Friday night I pulled out my King Arthur Baking Book and made a peach cobbler, which was really yummy! So far that book hasn't let me down. Saturday morning found Theresa, Bonne Marie & I at Stitches Midwest. I think one of my favorite booths was Habu, where I picked up this orange, slubby 100% silk. They only had 4 cute little balls/bails -- whatever you want to call them. I love them because they are neat little center pull balls and they have a nice piece of tissue in the middle that you pull to get the starting thread out. How clever! But I digress. . . So they had 4 balls in this perfect orange color and I decided that I'd just make a shrug. So far I swatched and the texture is quite nice due to the slubs. Hmmm. . .
My other favorite booth was the ribbon & button booth -- Nifty Thrifty Dry Goods in RI -- where I got this super-cute linen ribbon. It's a japanese import and it cost way too much, but I had to have a yard of it. She also had lots of vintage buttons that were not matching but went well together and were carded together. Not sure I'm explaining this well at all, but they were so wonderful! I could have just spent the day in this booth. And since I was thinking of buttons, I took a picture of the buttons I got from Goodwill a few weeks ago for 99 cents. They were all taped up in a bag and you couldn't see what was inside, but I figured I couldn't go wrong for that price! Sunday was spent at the river for my sister's birthday. The water was wild! We took my mom's boat up the river to a restaurant and just had a nice afternoon, but everyone was exhausted from their various weekend activities so we weren't a very lively bunch. This week is for organizing. My office is a mess and it's time to take control! I finished editing the first episode of Booga Talk too, but it's not up yet. Pete still has to have a listen first. I warn you, we are liberals and it shows. Knitting Rules is now available! Where have I been? Or did this just happen in the last day or two? Stephanie's new book is now shipping from Amazon! Woo-hoo! I'm feeling a bit. . .
. . . under the weather. You know, that feeling you get just before a cold? I'm planning on drinking lots of hot tea this afternoon. After all Saturday is my birthday and I really don't want to be sick on the day I turn 36! I've been working on a new bag design! I just love knitting felted bags. There's something about Cascade 220 and size 10 1/2 circs. It's my mac & cheese knitting. It's so comforting to me. I don't know what it is. So that's what I've been working on during the Olympics. It's perfect because I don't have to look at what I'm doing. That's Trekking XXL in colorway 107. My Trekking 100 socks are my favorites to wear, so I think this is probably a good investment. Alpaca, a knock-off and a great big pile. . . In an effort to find some balance, I have been trying to relax a little more and this involved a bit of weekend crafting. First of all, I spun up a bit of some lovely alpaca that I had sitting around for ages. After the CVM fiasco, this stuff was like buttah'! 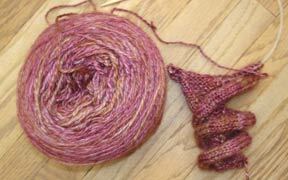 I'm going for a lace weight and hoping to make a shawl with the resulting yarn. It's a gorgeous soft cocoa brown, which may be difficult to discern from my crummy picture. And I've even been knitting! Shocking, isn't it? This is two pictures of the same thing. On the left with flash on the office floor and on the right with no flash on the radiator below the sunny window. The color is probably somewhere between the two but leans toward the darker picture. What is this strange balled up mass of yarn? Why it's Morehouse Merino laceweight yarn in some unknown colorway which I purchased at MS&W last year. Now I bought this because of the color, but I didn't like the pattern that came with it. So I thought and thought and cast on and tinked and thought and thought some more. Then I decided I would make Melody. 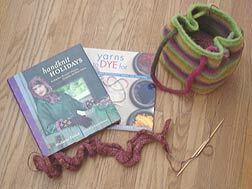 Speaking of Morehouse Merino, did you know that they have a book coming out? I'm eagerly awaiting it's release! And I'm eagerly awaiting another visit to their booth at this year's MS&W. (Why, yes! I plan on being there again this year. How about you?) Yes, right, back to the book. . .
Looks like it's going to have 40 designs. And I have to tell you that from what I've seen of their patterns, they are just nice simple things that you want and need to knit. Very much looking forward to this one! Many have been arriving at the house (some as the unlikely result of a power outage -- may that poor squirrel rest in peace). I need to find time this week to tell you more about them! I'm sitting here listening to WBEZ, my local NPR station, online and I hear Stephanie come on The World talking about The Knitting Olympics. Process -- all the way! Product, are you kidding me? ** Update ** The "Process" and "Product" knitters are dead even! How interesting! I thought it would be all one way or the other. And the majority of you say you are ambivalent and have answered "a little a both." Please feel free to leave a comment too! I find this subject fascinating for some reason. Maddie has tried them on and declared that they are warm & comfy -- so I think they are a winner! Holiday Knits by by Allison Isaacs & Sara Lucas. So of course I had to get the book. 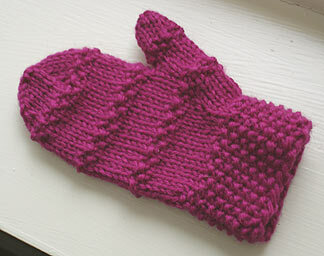 The mitten pattern is kind of nice because it is written with three different cuffs and two different patterns for the mitten part. And there are 7 sizes! 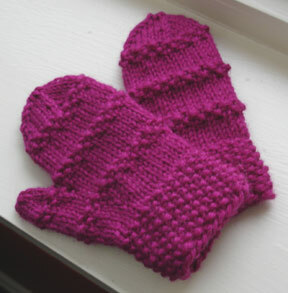 This mitten was knit up in just a couple of hours and uses hardly any yarn. I'm using the leftovers from the Princess Hat. There are no earth shatteringly original patterns in this book, but for some reason I really like it. I'll post a full review over at Two Friends Collect Books as soon as I find a free moment. How cute is this? Great gift idea! Silk Garden -- DK Weight!!! Is this so new that it's not in stores yet? Because I want some now!!! Yep -- Silk Garden Lite. The new yarn crack. On Thursday Theresa came over to keep my company post-surgery. And believe it or not, I actually finished something! Sometimes you just need to get out and do something fun with good friends! On Saturday Theresa & her husband John met Pete, Maddie & me at Intelligentsia up in Chicago. We went on the roasting tour which was very cool. This book was made by Emily of Orange Beautiful. I'm hoping she opens up an online shop soon because I loved her stuff! I'm a sucker for handmade books. 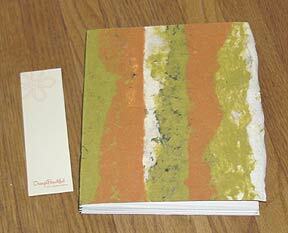 Theresa and I have even taken a few classes on bookbinding at Paper Source together. Which is a nice segue for a gift I received in the mail from Freecia. 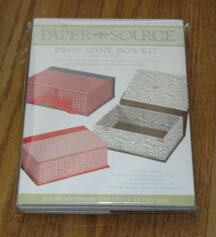 . .
A cool box kit from Paper Source! Thanks Freecia! 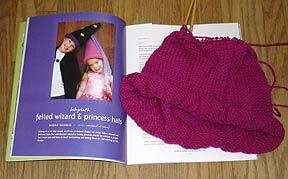 I'm making the princess hat for princess Madeleine! I feel like I'm manic depressive these days. One hour up, one hour down. Today I had an appointment with a neurologist who diagnosed me with migraines. He seems like a great guy and he shares my philosophy on medication -- only in moderation and only when lifestyle changes won't do the trick -- so I was really up after that. Then I had a pre-surgery visit with another doctor. Followed by a visit with the surgical consultant and down I went. I know it's just a minor surgery, but I was once again reminded of how painful this will be. I'm sure that has me stressed. I did start a new knitting project and I'll take pictures as soon as I'm a little farther along and it actually looks like something. 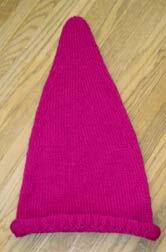 I will say this though, it's for Maddie, it's magenta and it's from New Knits on the Block . Any guesses? Well, I finally went to the "big city" to see a specialist and I have to have my tonsils out -- at 35! I'm not looking forward to that. Any other adutls out there who have had a tonsillectomy? I hear there is a lot of pain afterwards. Maddie turned 5 on Sunday! 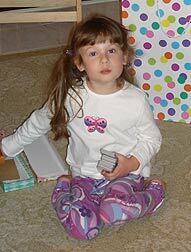 I really can't believe she is already 5. While riding in the car up to the hospital, I did a bit of knitting on my Ruffles scarf. Not much progress on Ingeborg this past week due to the party preparations and such. I did get a couple of new knitting books in the mail though! I'll be reviewing them soon! Last night I pulled out Scarf Style because I wanted to review it over at Two Friends Collect Books. (This is the new blog Theresa & I are authoring together!) And look what happened -- STARTITIS! Now I know why people love Colinette! I had this Pt 5 (colorway Blue Parrot) in my stash for ages. I got it in trade -- the one where the boxes were going around the country (I forget the name of that now). Anyway. . . I was looking for a quick little project and picked this out. I cast on 10 stitches on a 19US needle and away I went. It took two hanks and I'm loving it! I did a trade with Deb and got two balls of this lovely orange Kid Silk Haze in the mail. Now what does it want to be? I took a look at the list of suggestions I received before I started Birch. I'm thinking that I will see if there are any designs from A Gathering of Lace that will let me substitute the KSH. Barring that, I may make the Flower Basket Shawl. Will I have enough KSH? Anyone out there use KSH for this shawl? These were made using the generic sock pattern that I always use (Classic Socks for the Family by Yankee Knitter Designs). I did try a little different heel on this pair. I think it is the eye of partridge maybe? Basically I slipped alternating stitches on the knit side. (slip knit) repeated on the first right side row and (knit slip) repeated on the next right side row. It is difficult to show the effect in my photo, but I really like how it looks and feels. 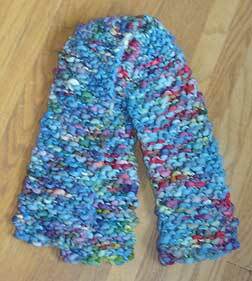 The yarn I used is a wool/hemp blend from Dzined in sport weight and colorway WH1287. I picked this up at the Michigan Fiber Festival. Bonne Marie, who was there too, turned us on to this cozy stuff. And here is the incredible alpaca that I got at Northampton Wools, located at 11 Pleasant St., Northampton, MA 01060 (no website). This was a wonderful shop with helpful salespeople. I have never seen the Frog Tree Alpaca anywhere else. Frog Tree is made by a women's co-op in Bolivia, and is reasonably priced at $7.00 for 130 yards (at least at this store). I'm planning a super soft scarf, possibly with cables for this yarn. I am an alpaca addict. I'm getting caught up on Knitting Blog Ring business and trying to settle back into the regular routine. I think one of the best tings about vacation is never having to cook a meal, sigh. . .